I love the Sprinkles of Life stamp set. Each year, Stampin’ Up! designates one stamp set that benefits Ronald McDonald House Charities (RMHC), and this year’s set is Sprinkles of Life. Stampin’ Up! donates $3 of the purchase price for every sale of this set. It’s one of my favorites in the new annual catalog because it’s so versatile. There’s even a matching punch, the Tree Builder punch. I’ll be showing you several cards throughout the year that I’ll make with this set. It’s just so adorable. For today’s card, I used a Tip Top Taupe card base. I will admit that when I saw the new In Colors for 2015-2017, I was least excited about Tip Top Taupe. I’m not a taupe fan in general; I lean toward grays. And taupe is so bland. But just as going out of your way to befriend someone who really rubs you the wrong way can make you a lifelong friend, so can going out of your way to use a color that makes you want to go to sleep help you find a color that isn’t so bad after all. And after I made myself use TTT (I feel like I should dye my hair tips platinum and call it Triple T), I started to actually like it. On top of the card base is a layer of Watermelon Wonder cardstock, which I embossed using the Decorative Dots folder. I loved Watermelon Wonder before I ever used it. So bright and cheery. Skewed on top of the WW layer is a piece of the Cherry on Top DSP stack, which I love (bright colors and not an overabundance of flowers!). 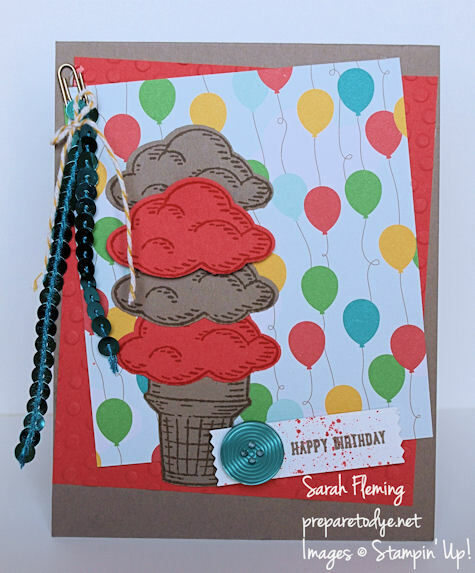 The ice cream scoops are done in Watermelon Wonder and TTT (same color ink and cardstock). I punched all of the scoops out with the Tree Builder punch. I stamped the cone in TTT on TTT and cut that out by hand. I used the Multipurpose Glue and dimensionals to adhere the ice cream. The sentiment is also from Sprinkles of Life. I stamped it in TTT, punched it out with the Washi Label punch, and then used an Aquapainter with Watermelon ink to splatter the label. The button is one of the Brights Designer Buttons, and I attached the label with Dimensionals. The fun times happening in the upper left corner of the card are a paperclip from the Moments Like These Project Life Accessory Pack, Bermuda Bay Sequin Trim, and Crushed Curry Baker’s Twine. I used Crystal Effects to glue that decoration down.